Brace yourself - the pictures are coming! As I mentioned before, we were blessed with the opportunity to spend New Years in Florida. Matt's parents gave us the amazing gift of plane tickets and free rein in their vacation house for four days! It was truly a much needed break. The four of us had a great time exploring on our own, and we were also able to get a chance to see some of my family that I had been missing. The temperature hovered right about 80, which was just wonderful. The day before we left we had been building a snowman in 6 inches of snow, and then on New Year's Eve we were on the beach! 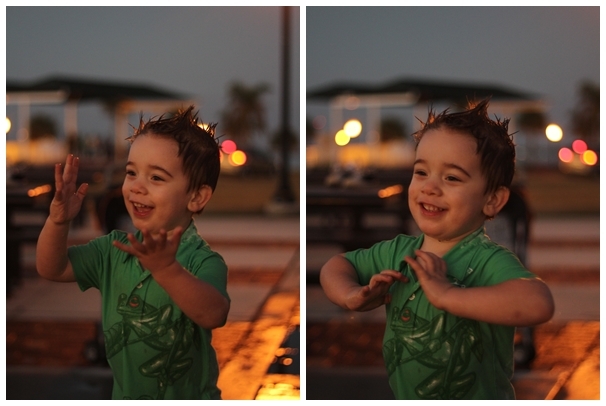 As you can see by the above picture, Jack was SO excited about the ocean. Luke was...not. But he did love the sand and the seashells. 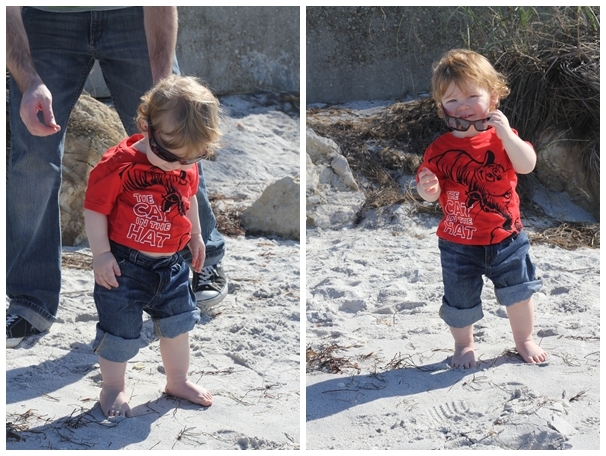 This was his first time ever seeing the ocean, and it was adorable to see his expression. 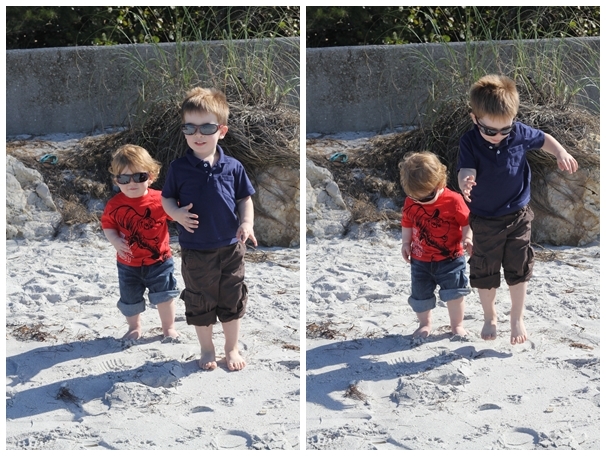 We put him down to stand in the sand and he just looked at the ocean for a while before starting to dig. We spent our days exploring beaches, wildlife parks, and playgrounds, and we spent two of our evenings at my cousins house, with her sweet family and my Aunt Lucy and Uncle Dave. At the beginning of the year, I remember saying something along the lines of 'bring it on 2012' and it really did. This year has been hard. So hard. I mean - there have been beautiful moments, moments I will never forget, but there has also been a lot of change and a lot of heartache. So this? This was a wonderful way to say goodbye to a hard year - and to greet a new one with hope and excitement. 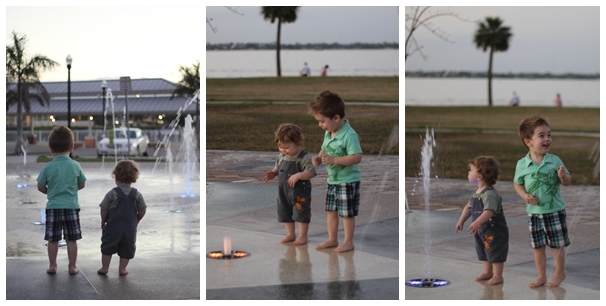 On our last evening there we explored a few parks, one of which had their splash pad going. We hadn't really planned on letting the boys get wet - but sometimes you have to go with it, you know? Their joy was contagious, and Matt and I found ourselves just smiling ear to ear to watch our little boys cavort in the water. 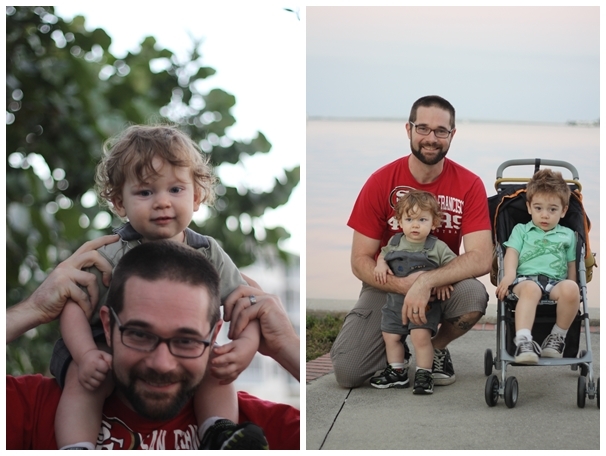 We have been taking Jack to this park on vacation since he was just a little baby, so it was doubly special to take Luke for the first time. 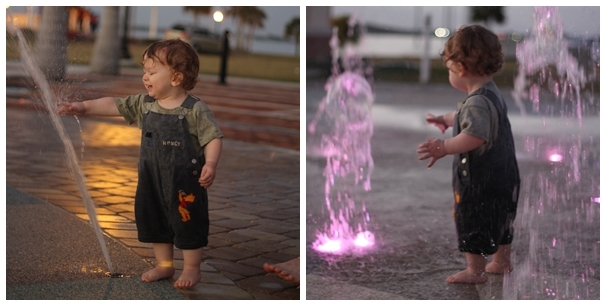 He happily followed in big brothers footsteps through the fountains. Eventually he got so soaked that he had to go pantsless. Those thighs. And while Luke was getting his pants wet...guess what Jack was doing? He was one happy three year old! And now...what would a vacation post be without a sunset shot? We are so grateful for the opportunity to spend this time together. We needed it badly, and we have high hopes for 2013. Be gentle 2013, be gentle. I love how suave the boys look in those first two pictures and HOW CUTE are Luke's little dungarees?! 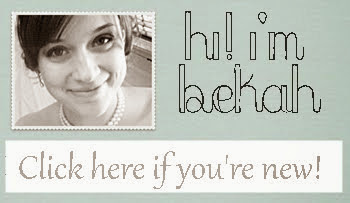 What a great gift--I feel a little more relaxed just LOOKING at your photos! these pictures of jack and luke are just beautiful. they are such happy boys!! i love you sisty! God has big plans for your family in 2013 and beyond!! What a great way to end the year/start a new one! It looks so peaceful and fun. The boys look beyond happy. All the best to you and your family for 2013! Awwwww these are the sweetest pictures!! Such a fin way to ring in 2013! what an amazing vacation! I love your family pics and the one of Jack seeing the ocean would make even the grumpiest person smile! beautiful! I LOVE the one of Jack looking at the ocean!! That is a great shot!